Objective: To determine selectivity's single and cluster of the seychellene (CID519743) compound such as cyclooxygenase (COX-1/ COX-2) inhibitor by invitro and In silico analysis. Methods: Fraction of seychellene obtained fractional-vacuum distillation patchouli oil by Pilodist-104. The fraction was determined through IC50 COX-1/ COX-2 value by colorimetric test COX-ovine 760700 and the effect decreases the expression of COX-1/ COX-2 on pre-osteoblast cell to induce LPS. Molecular interaction studies single/ cluster of seychellene and other compounds with COX-1 and COX-2 used the molecular docking tools by Hex 8.0 and the interactions were further visualized and the binding energy was calculated (with Generalized Born Molecular Volume (GBMV) model solvent) using Discovery Studio Client 3.5 software. Result: Fraction of seychellene obtained from patchouli oil in fraction-5 (25.05%). The IC50 values of fraction-5 were: COX-1 (73.47μM) and COX-2 (73.31μM). The fraction of seychellene decreased the expression of COX-1/ COX-2 isoenzym. 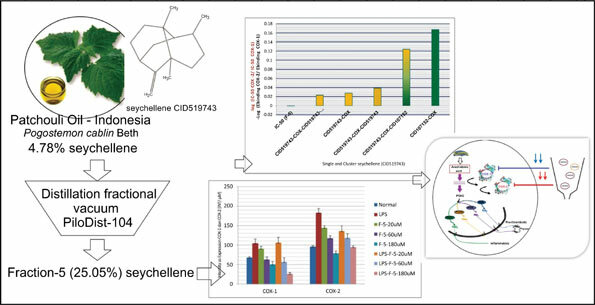 In silico analyses of scoring binding energy calculation (with GBMV model solvent) of single and cluster seychellene compounds affected the selectivity of COX-1 and COX-2 inhibitor. Conclusion: Collectively, selectivity's of the seychellene compound as non-selective inhibitor cyclooxygenase. Keywords: IC50, in silico analyses of scoring binding energy, inhibitor selective, selectivity, single/ cluster seychellene compounds. Keywords:IC50, in silico analyses of scoring binding energy, inhibitor selective, selectivity, single/ cluster seychellene compounds. Abstract:Objective: To determine selectivity's single and cluster of the seychellene (CID519743) compound such as cyclooxygenase (COX-1/ COX-2) inhibitor by invitro and In silico analysis.